London South Bank University (LSBU) is to receive a research grant of up to £200k from the Engineering and Physical Sciences Research Council (EPSRC) to investigate the potential of heat recovery from sub-terrain structures, such as sewers, electricity cable tunnels and underground railway tunnels. The LUSTER project – London Urban Sub-Terrain Energy Recovery – will use existing heat maps and energy usage data from buildings in certain parts of London to identify areas with the most potential for heat recovery. The findings will map these locations, often situated in close proximity to areas of high heat demand, and suggest ways in which these untapped energy sources can be used to heat our buildings in more efficient and cost-effective ways. Currently, heat is one of the biggest users of energy and greenhouse gases in our cities. 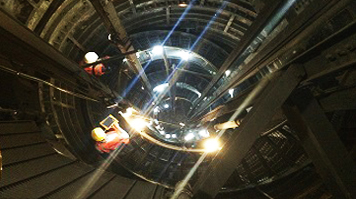 With the UK government committing to an 80% reduction in greenhouse gas emissions by 2050, it is hoped that a successful feasibility study will yield many opportunities for urban subterranean energy recovery, applicable to London and other cities and urban areas across the UK with underground infrastructure. The LUSTER research consortium includes University College London (UCL) and other partners from the UK’s major utility companies. “The team at the UCL Energy Institute, UCL IEDE (Institute for Environmental Design Engineering), (Hector Altamirano, Steve Evans and myself) will be using information about London tunnels to geo-locate these untapped sources of heat. This information will be added to the London area of 3DStock, our geospatial and geometrical model of the building stock of England and Wales. The LUSTER project builds on existing evidence surrounding waste heat generation in these underground sources, as previously discovered by academics at LSBU. When partnering London Underground Ltd and Islington Council in a previous research project, the team found that the re-purposing of heat generated by the underground tube system has the potential to improve London’s energy efficiency and cut carbon emissions. LUSTER will expand on this by investigating other untapped underground resources in more locations.